Upper Dublin’s Lucas Roselli breaks out for what would be an 88-yard TD run, Saturday, against Unionville in the opening quarter. FORT WASHINGTON — Every great ride comes to an end. For Unionville, which mounted an improbable run deep in the District 1, 5A playoffs after one of the most challenging seasons in recent history, the big red stop sign came in the form of no. 2 seed Upper Dublin, which cruised to a 40-7 win Saturday afternoon in the 5A semi-finals. And while the loss for the 6-7 Indians hurts — a year after they won the 5A district title — this is a team that found redemption in the postseason after a tough 4-6 regular season. 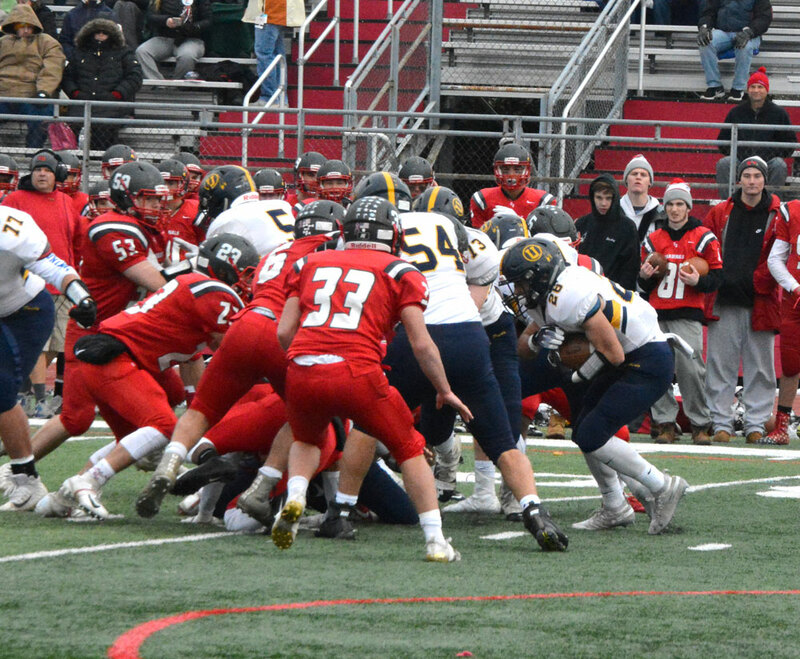 A mere 11 seed, Unionville went on the road and posted strong upsets over Springfield and then Radnor to extend their season to the brink of Thanksgiving. No single loss can change the evolution and growth this team saw in the last month or so. Unionville’s Connor Schilling looks for running room, but finds little, Saturday. And while the final result wasn’t what Clark or his team hoped for, a second straight deep playoff run signals a new expectation for his Unionville program: compete every year for the District title. 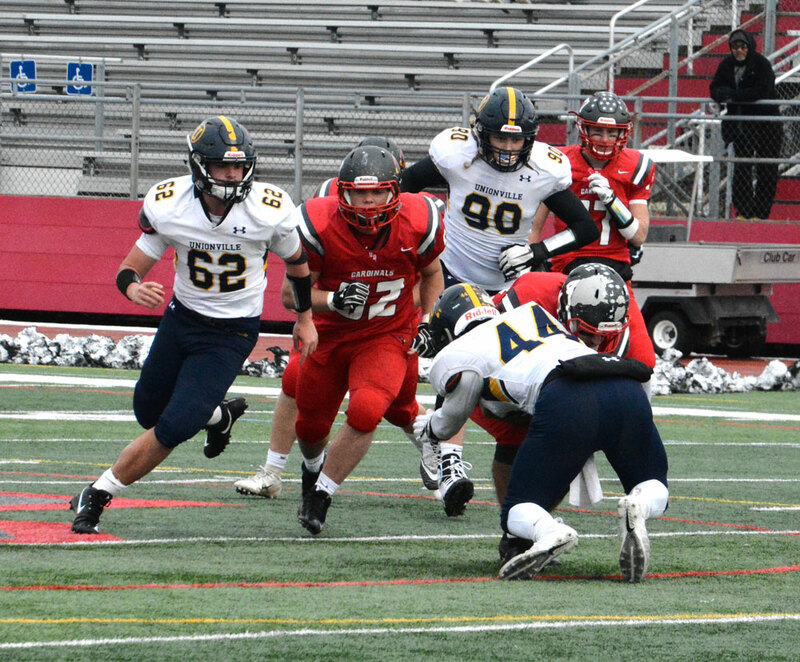 Of course, as far as Unionville is concerned, it didn’t help much that the 12-1 Cardinals – known for their explosive pass attack — came out running behind senior scatback Lucas Roselli and bruising senior fullback Mason Novak. Enjoying a size advantage upfront, Upper Dublin was able to power the ball up and down the field at will. Unionville’s Alex Pelegrin hits Upper Dublin fullback Mason Novak to stop him cold. At the same time, the Indians’ run game, which had really found a higher gear in recent weeks struggled to get the ball moving — again, the large and powerful Cardinals’ line allowed little in the way of running room, keeping Unionville off the scoreboard until late in the game when both teams began substituting younger players. Roselli set the tone early, ripping off an 88-yard TD run — after a Unionville three and out to start the game. Roselli and Novak then combined to power another long drive, with Novak scoring from five yards out to make it 14-0 before the end of the first quarter. Another drive — sparked by a couple of key passes by junior QB Mike Slivka — made it 20-0 when Slivka dove in the from the one. Moments later, a Westin Grimm punt attempt was blocked and recovered by Jason Scott for another score to make it 26-0. 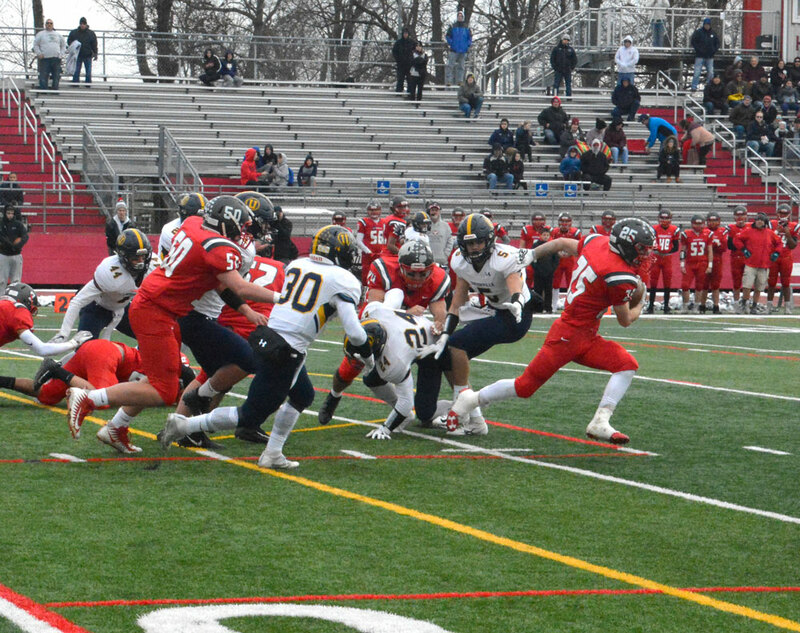 It was here that Unionville showed a bit of a spark, mounting a long drive, pushing the ball inside the Upper Dublin 25, but senior QB Nick Schnaars saw a pass picked off by the ever-present Roselli, stopping the drive cold. To add salt to the wound, Roselli caught a pass from Slivka and then raced 60 yards for a score in the final seconds of the half, to make it 33-0 at the half. Unionville’s Joe Fariello finds running room. To start the second half, the Cardinals engaged in the sort of clock eating, soul crushing drive they needed to put the game away. Eating more than six minutes off the clock, they pounded the ball down the field, 65 yards, with Roselli capping the drive with an 8-yard run to make it 40-0. 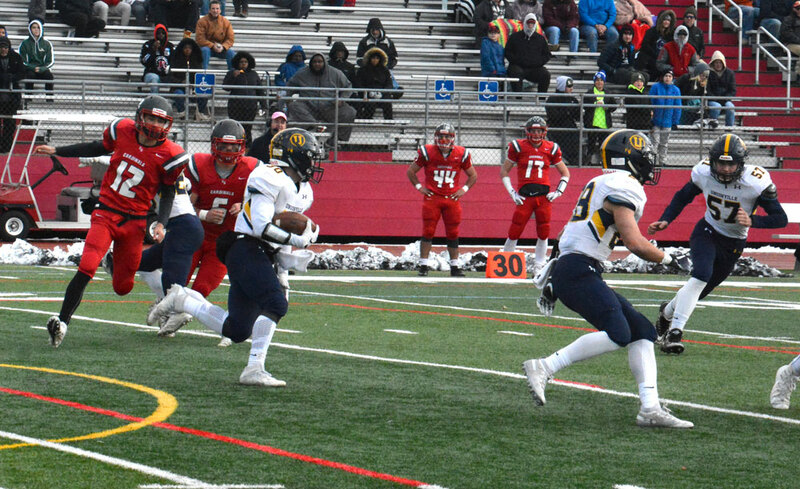 Junior running back Connor Schilling got Unionville on the board with a 39-yard TD run in the final quarter, but the game was largely out of reach — both teams began subbing in younger players and backups. 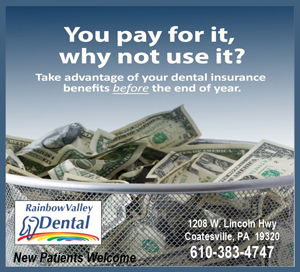 In other District 1 action, Coatesville overpowered Garnet Valley 42-7 to advance to the 6A District title game next week at North Penn, which defeated Downingtown West, 35-21. West Chester Rustin edged PennWood, 10-7, to advance to the 5A final at Upper Dublin.